It's been three years since Ben 'Yahtzee' Croshaw first brought his prickly outlook and charming animations to The Escapist. Since that first video, Yahtzee's offered up his thoughts on dozens of games, the occasional trade show, and even a bit of viewer mail. With over 150 episodes already on the site, we thought it was high time to let you, the viewers, pick your all time favorite. We combed through the archives of Zero Punctuation and managed to narrow the list down to 64 of the best episodes from throughout the history of the series. Over the next week, we're giving you the chance to vote on your favorite episode. Come back each day as we narrow down the list and we'll rerun the winning episode Wednesday, September 1. Even better, when you vote, you'll be entered in a drawing to win one of ten signed copies of Yahtzee's new book, Mogworld. So what are you waiting for? 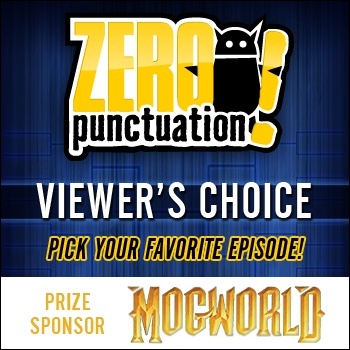 Get over to our Zero Punctuation Viewer's Choice bracket and start voting!